I went through 25+ hours of madness getting my firmware updated to the latest on my Printrboard Rev D. That's all working great. But when I plug in my Extrudrboard, I get the same problem as described in http://www.printrbottalk.com/forum/viewtopic.php?f=15&t=4063. : Extruder switched off. MINTEMP triggered ! If I plug in the LCD, the com port and connection disappear. I've watched Brook's video of setting these up and am following his pin connections. I've got a second PSU powering the Extrudrboard per spec. Anyone have this working? Did it just work or did you have to do anything special? Last edited by Tdeagan on 2013-Sep-Mon-19-Sep, edited 1 time in total. Re: Anyone successfully added an Extrudrboard/LCD? I finally got my firmware updated and finished wiring. I will be testing in the next day or so. Did you plug a thermisister into the empty 3rd extruder plug? Kf so you will need to. Interesting. A thermistor into the third extruder plug? I have my second extruder/heater/thermistor plugged into the first of the two connections (aka the second extruder connection set,) but nothing else but power and the ribbon cable. Are there docs that describe the additional thermistor you're noting? Does it go into the 3rd thermistor socket? It's a two wire connection so it's hard to picture it going into the motor plug. Ya it goes into the 3rd extruders thermisister plug. Otherwise it tripps out and gives warnings. I believe Printrbot is going to add it to the kit. I know for the dual extruder kit production version not beta. It will be included and I would also assume it would be added to the extrdrboard kit as well. I watched most of the second video (the parts that seemed relevant to just the Extrudrboard and LCD, but not the Printrbot stock extruder kit.). But I didn't watch the other two. I get really impatient watching videos. They're so linear. My learning style betrays me with them. I can spend untold hours combing data sheets or reading manuals or web material, but watching a 3 minute video just kills me. I've been trying to learn Blender, but all the tutorials are videos and its like pulling teeth to sit through them. They're clearly where the world is going. Sigh. I need to tie myself to a chair and toothpick my eyes. I burned the specific firmware (Printrbot-LCD-Extrudr-Firmware) in case the latest Marlin I was using was wrong. I'm still struggling with a critical work/no-work app note like the third thermistor thing being tacked onto the end of a video. I only stumbled across those vids, it's not like they were listed on the product page as required. Seems like that would be something you would note on the product page or in a tech note sent with the product. Whatever. I don't have a third thermistor (I've been a thermocouple guy up to now.) But it seems like a standard resistor would fulfill the same purpose. My intertoob search says it's an EPCOS 100k NTP thermistor, which suggests that I could use a 100K resistor across the third thermistor port. Either way, attaching my LCD still causes the system to drop the com connection, so something is not right there. I'll try out the dummy load on the third thermistor port and report back. Ya I agree with you. Supposedly the recent changes Printrbot has made is to get a handle on this sort of stuff. So hopefully they do. Thats a big reason for my blog, is to attempt to help and clear up as much confusion as possible. I whipped up a 100K Ohm resistor with the proper plug and plugged it into the third thermistor port. I still couldn't get the Extrudrboard to work. I compiled and flashed the latest Marlin firmware, it's more recent than the special LCD/Extrudrboard version, says it supports the LCD and I wanted source. I removed the dummy load and, for lack of a better term, 'fiddled' with the Extrudrboard, watching the VDC output of the heater (with Pronterface trying to set the T1 hotend to 185C.) And it started working. So now, I have the Extrudrboard working, pushing my #2 (T1) extruder with nothing plugged into the third thermistor port. However, if I connect the LCD, the Printrboard goes offline and won't provide a USB connection. I just traced every pin on the LCD and there aren't any shorts. It's a _very_ simple board and I'm really familiar with the standard 16x2 LCD. When I plug it in, the backlight comes on, Row 0 and Row 2 go solid black. The printrboard loses it's ability to provide a COM port. It's kinda acting like it's drawing too much power, but I pushed the RAMPS 1.4, 2 ABS heated extruders and a bed at 100C plus the LCD controller off a single 350W power supply. Now I've got an additional supply, so I'm highly skeptical that this little LCD is pulling too much current without a short. There must be some abstraction/redefinition going on someplace that I'm missing. But incorrect pin assignments could cause very similar symptoms. It would put it right on top of the USB pins of the aat90usb1286. The other pin assignments for things that are working don't map to the actual at90usb1286 pins. Tdeagan wrote: There must be some abstraction/redefinition going on someplace that I'm missing. Yes, I ran into that - and set it aside for later deep study. In my case, I was wanting to remap the Z motor output to different pins in order to use one of the headers on the Prinrboard. But when I traced through config.h to what the existing pin assignments were, there was no correlation to the physical pins on the Atmel chip. And in the case of the motor control pins, there was not even the mapping of Port X Bit y... Totally confusing. Lwalkera or Pxt (I forget which) explained that the Arduino ecosystem uses an arbitrary higher-level pin mapping to make it "hardware agnostic." But then there's a confounding factor of the "fastio" add-on which apparently re-maps again. So you've got to have a pretty high tolerance for intricate mapping, and you've got to be able to track down documentation resources (pin mappings) that I can't for the life of me find anywhere. Good luck, my friend! If you find the magic table (tables) of mappings, please share them on this forum. I'm with you. Funny you should ask that, I just spent the last 7 hours making the spreadsheet below. Last edited by Tdeagan on 2013-Sep-Mon-11-Sep, edited 1 time in total. For what it's worth, the Pins.h from the Marlin github does not agree with the numbering you have in your chart. * Requires the Teensyduino software with Teensy2.0++ selected in arduino IDE! * Requires the Teensyduino software with Teensy++ 2.0 selected in Arduino IDE! #define AT90USB 1286 // Disable MarlinSerial etc. #error Oops! Make sure you have 'Teensy++ 2.0' selected from the 'Tools -> Boards' menu. Which firmware version is your pins.h from? This is convoluted stuff. I spend much of my work-life futzing with issues like this. A few choice blog posts/notices on the Printrbot website would go a long way to clearing things up. "This version is for supporting Printrboard The copy at https://github.com/PxT/Marlin is the official source as shipped by Printrbot HQ." That may have been true at a point in the past, but is (apparently) no longer accurate. In his videos, Brooks is promoting https://github.com/Printrbot as the official site. The Marlin code has a gazillion forks. This is the network chart of the Printrbot site's code: https://github.com/Printrbot/Marlin/network You can see the fork by PxT a little ways down and by scrolling around you can see that PxT had commits as late as June 4 that haven't been committed to the Printrbot fork. Printrbot is a lot more active and has lwalkera as a contributor. This thread notes him talking about the Printrbot fork http://www.printrbottalk.com/forum/viewtopic.php?f=22&t=2980. Warning: I'm a SVN user who s trying to wrap my head around Github and may be terribly terribly confused. FYI. I have found the LCD I bought from Printrbot had the LCD wrong. Should be a 5v LCD, Mine came with a 3.3v LCD. This caused all kind of problems. I also responded in Thew's thread. The USB connection disappearing is more a result of Brook just ordering the cheapest LCD he could find, not checking the specs, and ending up with 3.3V LCDs. Fortunately, the only thing different is the value of the current limiting resistor for the backlight. You can disconnect LCD backlight and stop the overheating and browning out by unsoldering the solder jumper on the back of the LCD to the right(when the front is facing you) of the pin header. This kind of stuff really needs to be caught early on or at least have a page with workflow notations as far as what happened, how it was fixed etc. I am a die hard Printrbot guy all the way but, if this kind of issues aren't figured out soon I feel that a lot of people will go somewhere else. Printrbot says they are going towards a more user friendly bot so I guess only time will tell. In the meantime I guess I am learning a ton just trying to do basic modifications or at least what I consider, "basic" to be. Within the next few days my belts and pullys should be here and I will start printing with the dual extruder setup so ill keep you guys updated on the progress as I will be adding an lcd after I chase down the dual e issues. Printrbot is a lot more active and has lwalkera as a contributor. This thread notes him talking about the Printrbot fork viewtopic.php?f=22&t=2980. I'm with you on the confusion. I left a comment on the pins.h checkin that changed the pin numbers in the most recent printrbot firmware asking what abstraction layers are in play. I'm now digging into the core_pins.h file that lincomatic talks about. It's not in the actual firmware source, it's in the arduino-??? ?\hardware\at90usb1286\cores\at90usb1286 subdir that the teensyduino stuff sets up. I'll add what I find to the matrix I'm building. I've added the core_pins.h definitions. Clearly a lot of those are in use. One explanation for the pin numbering switching we see is the use of different def files. But I'm still not clear on which ones/when/how. The 'key' between the different definitions is the PIN, i.e. PINA0 is what I'm matching every instance of something referring to port A, bit 0 to, wherever something refers to it. lwalkera wrote: The USB connection disappearing is more a result of Brook just ordering the cheapest LCD he could find, not checking the specs, and ending up with 3.3V LCDs. Fortunately, the only thing different is the value of the current limiting resistor for the backlight. You can disconnect LCD backlight and stop the overheating and browning out by unsoldering the solder jumper on the back of the LCD to the right(when the front is facing you) of the pin header. I put in a broken part request to Printrbot. Given that it was a $65 component, I'm not over-eager to just fix it (or semi-fix) myself. A backlight is pretty useful on these displays. Almost every other LCD/controller board with identical functionality/parts on the market costs less than $55 and many less than $45. None of these options are terribly palatable. I understand Port A Bit 0 etc, and I can see from the schematic and from the Atmel data sheet how that maps to a physical pin on the chip. That's the kind of programming I cut my teeth on back in the day. And I understand the concept of - and the reasons for - a level of abstraction. I have used it myself. Got my RAMPS 1.4 LCD working with the Printrboard by making a simple patch cable out of breadboard jumpers. That's the $45 board working where the $65 Printrbot board didn't. RetireeJay wrote: I understand Port A Bit 0 etc, and I can see from the schematic and from the Atmel data sheet how that maps to a physical pin on the chip. That's the kind of programming I cut my teeth on back in the day. Quick question as lcd related things are by no means my strong part but, couldn't you buy an I2c lcd with 5v and wire it to work the same as buying a Printrbot one. I ask because I am looking for a cheap solution. I know you can buy them for less than 10 bucks and even get them with a built in sd card. Any info would be great. The firmware is set up to expect a 4x20 LCD (driven in 4-bit mode). I haven't looked at the other marlin options, there may be an i2c option in there, but it wouldn't be happy coming off the Printrboard ext2 pins without a lot of new code. It's also looking for a rotary encoder switch for menu selection.http://www.adafruit.com/products/377 The LCD and the rotary encoder could be bought for as little as $15 combined and breadboarded to work just as well as the Printrbot LCD controller. I used a standard RAMPS 1.4 LCD smart controller with a very simple patch cord. I see those on the market for as low as $40. They work exactly the same as the $65 Printrbot LCD controller. I am addicted to the LCD and controller at this point, having that control makes printing a good bit easier for me. Your talking me into it....I think I might just end up getting a ramps one since I have a ramps controller also. 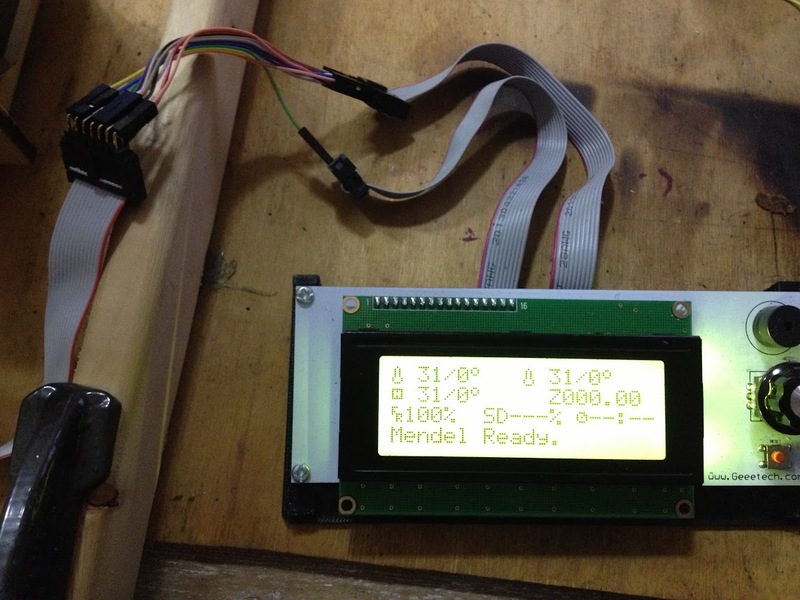 So I take it that its about the same setup using the ramps lcd as the printrbot one..? Check out my post above. I used some breadboard jumper cables and figured out the patch and it works great! Not all the ramps controllers are exactly the same, but they're all almost identical. All of them should be pretty close but I'd check the schematic to make sure. The one I have is a clone of the RepRap discount smart controller http://reprap.org/wiki/RepRapDiscount_Smart_Controller. It includes an SD card slot, but I just ignored those pins.